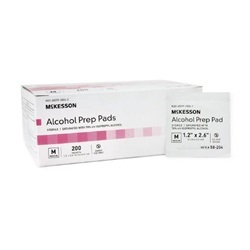 Medium sterile Alcohol Prep Pad Isopropyl Alcohol, 70% in individual packets. Comes in a box of 200. Manufactured by McKesson. NDC number: 68599-5804-01. Measures 1.2" x 2.6".